People often say that companies take time more than necessary to hire the candidates but in actual hiring a candidate is very important to an organization. Hiring a candidate is not an easy decision; a bad decision can cost more than what we think of an organization. Hiring unqualified employee is one of those bad decisions taken by the company that harms more than in one way and for a longer period of time. Any successful organization understands the importance of hiring a right candidate that’s why on an average most companies spend months of time and thousands of money to choose the right candidate. Hiring unqualified candidates is like suicide in the business world. Hiring unqualified candidate shows the decision-making power of an organization and it also affects the company’s goodwill and market value. When an organization hires unqualified candidate, it starts a whole cycle in which organizations faces so many problems and most important the waste of money it causes to the organization. The company pays the prices for breaking that cycle by replacing bad candidate but taking a good decision is very important because it can start the whole cycle again. These are the costs a company bears when hiring a bad candidate. To hire a candidate for a post in a company an organization spends money on selecting candidates, scheduling interviews, taking interviews, hotel expenses, travel fair and food expenses. The cost of hiring a candidate increases if the post for which organization recruiting is higher in rank. For example, when a organization schedules recruitment process for low rank, they do not bother the top management and decisions made on managerial level that’s why expenses bear by the company is low. But on the other hand when a company hires high-rank individual, expenses do become high because top management get involved and all the arrangement made by company also have high standard. When an organization hires the bad candidate and pay salary monthly, it all goes to waste. If the services company get in exchange for salary are of poor quality or low standard then company faces other problems as well. Company faces double loss after hiring a bad candidate, for example, company is already paying salary to the bad candidate because he/she is part of organization but the task he/she is getting salary for is still not done then company going to need someone else to the work or existing worker needs to do the extra work. This is all because of one unqualified candidate company paying more amounts for a work that can be done on lower price. Training cost is the money company spends on the new candidates to train them for the work. If the candidate is unqualified for the job then the money organization is spending on him is going to be a total waste. Sometimes it does happen that the trading cost of an employee goes higher than the estimated cost. An unqualified candidate causes only problems for the organization. According to a report, the replacement cost of a candidate is nearly 20% of his annual salary and this goes all to waste because of a decision of choosing a candidate for the job. All of the procedure of hiring new candidate begins when you want to replace the unqualified candidate and the money you spent on this existing candidate goes to waste. Replacement cost goes high when the candidate is of higher rank or work for a long duration in the organization. You can’t expect a high quality of work from an unqualified candidate. The work done by an unqualified candidate never meet the expectation and this cause money loss as well as reputation of an organization in front of clients and delegates. Hiring an unqualified candidate is a risk where lots of things are on the stack because the person is not qualified for the job and you can’t expect top quality work from someone who is not even suitable for the job. Hiring unqualified candidates affect organization in more ways than you think. Everything is co-related to each other in an organization and hiring a candidate is a part of the cycle where unqualified candidate sets the whole cycle of work on the wrong way and company has to pay the price of a wrong decision of hiring an unqualified employee. These are the effects of hiring an unqualified employee. The reputation of an organization depends on the basis of the work they do and their employee. If an organization hires an unsuitable candidate for the job it shows the poor decision-making skill of the organization and you cannot gain good reputation in the market if your employee is not qualified for the job. The reputation of an organization affects in a very bad manner after hiring an unqualified candidate. So choosing a right candidate is a must for any organization. 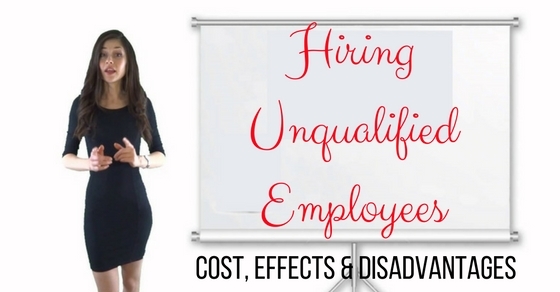 Hiring unqualified candidate can damage company good will. Hiring unqualified candidate is like a big stain on company good will and it represents how unfit an organization is by not hiring right candidates and it will look bad in front of potential clients and customers. If the candidate is from the higher rank in the organization then it affects more because an unqualified worker is less harmful than unqualified manager due to the responsibilities they have on their shoulder and decisions they take when working for the organization. Client satisfaction is what a company works for and also to gain profit. Client satisfaction means that organization doing their work in right manner and employees are qualified because you cannot attain client’s satisfaction by unqualified employees. Client satisfaction also boosts worker confidence and your image in the marketplace. Hiring unqualified candidate result in the unsatisfied client because of the work they do, this can put the burden on other employees as well because now they have to work hard and more to keep the client satisfied. The quality of work also decreases by hiring an unqualified candidate. The high quality of work is what make you successful in the business world and an unqualified candidate affects the quality of the work in the organization because he/she doesn’t suit the qualifications company needed and not suitable for the work because he/she have no knowledge of that work. For example, you cannot expect good managerial work from an artist or musician because managing an organization is not what they are good in. Hiring unqualified candidate is just waste of time because the time you spend on hiring unqualified candidate never work in your favor and company will need to start the recruitment process again. So the time spent on the wrong candidate goes to waste and time is very crucial to the success of the organization. You cannot do your work if you don’t have right candidates to perform the task and hiring a right candidate is what organization need but selecting an unqualified candidate set everything on wrong track and waste so much time. Time is money when it comes to the business world. Having an unqualified candidate in an organization has many disadvantages. Unqualified candidate lack in working department, as well as they, disturb the environment of the company and others may lack in their work. This is one of the main disadvantages of having an unqualified candidate in your company, they disturb others and decrease the productivity of the company. Another disadvantage of having unqualified candidates is that they are not suitable for the work. Their qualification doesn’t match with the work they going to do so their productivity decrease as well as productivity of a company. Quality is what matters when you stand in a market and hiring unqualified candidates can put you in a compromising condition. Another disadvantage of having an unqualified candidate is that they take more time and resources to do the job where qualified candidates do the job more economically and effectively. Unqualified candidates lack the basic knowledge most candidates have when they have right qualifications for the job, that’s why unqualified candidates take more time to do the job than needed and that result in unsatisfied clients, high cost, and bad reputation. One of the most important disadvantages of having unqualified candidates are that they cost so much to the company. Money involves in hiring, training, and salary all go waste because they are not the right person to do the job and then the replacement cost also include. Hiring a right candidate is very important to have a successful organization and it shows how responsible you are in handling your organization. Money involves in hiring candidates that have a direct impact on the company turnovers because all the money goes from the company account. When an organization starts recruitment and hire candidates to do the job the main motive is to hire candidates who are qualified and can do the job as per company standards and requirement but it changes when a company hires unqualified candidates. Hiring unqualified candidates affect the whole work system and production as well as it is expensive to have an unqualified candidate in so many ways. Now the question is how to deal with unqualified employees? To deal with unqualified candidate’s first, make changes in your recruitment procedure and hiring a team, include a better job description and experienced employee who directly involve in working area. Make necessary changes in company’s policies regarding work and termination; also don’t take too much time in replacing the unqualified candidate because it will become messier and costly to replace them after the ending of their probation period. Replace them as soon as possible without creating a mess because it may backfire if you fire a candidate without suitable reason after their probation period end. It is better to take action before it is too late because there is so much on the stack to lose and most important, company reputation in the marketplace. Replace unqualified candidates and make sure to choose the right person for the job as well as use their qualifications in best possible way. A successful organization is made on the basis of choosing the right person to do the job. When a company starts recruitment, it affects the whole organization at very large scale. Hiring right candidate is important because workers are those who do the job on the ground level as well as good candidates going to do the task more effectively and if they are not qualified for the job they will never attain good quality in their working and this will show in your services and products. Hiring unqualified candidates is costly as well as time taking and it decreases the productivity of a company. From the above discussion, it is clear that hiring unqualified candidates can cause you a failure and damage your company’s name in the marketplace. Choosing right candidates is like eating the right food, if you are eating bad qualify food your body going to suffer the consequences in the same way if you hire unqualified candidates your company going to suffer the consequences. An organization becomes successful by choosing a right candidate, so choose people carefully and smartly who are going to work for you because the success of your company depends on your worker and how qualified they are for the job.